Step up your game with sports wear and gear from Khelkart, in Madhapur. This local sports store has everything from cricket bats to swimming suits. This two storey sports store stands out in the busy area, thanks to its vibrant logo. 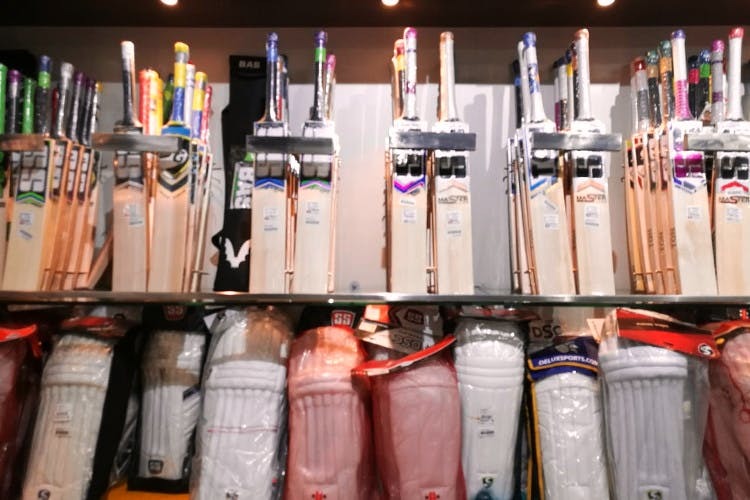 We browsed the first floor to find leather and synthetic cricket balls, cricket bats from brands like SS Master, Bas Bow, Ton and the like, badminton rackets, shuttlecocks, sports shoes and tennis bats and balls too. In fact, you can buy an entire cricket set with kneepads, helmet, ball and bat here. (You're little sibling will be overjoyed to receive this, we think). For football and basketball lovers too, they have plenty of options that suit the build, and age. The second floor has comfortable, stretchable swimwear and swimming glasses for both men and women, athletic wrist bands, and yoga mats. There's a corner dedicated to board games, and another that stores carrom boards and trophies (just in case you play to win!). So, whether it's for your kid who loves outdoor games, or for yourself who wants to revisit a sport — this store offers reasonably priced gear starting at INR 800. We were hoping to find roller-skates, and skateboards too, but unfortunately they're not at Khelkart yet.